I am not quite sure how I managed it, but I actually had three bloggy events launching today! 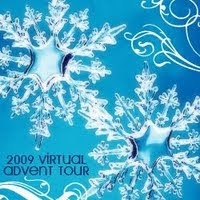 Not only did I post the announcement of the Terry Pratchett 2010 Challenge, but today is also the day that we launch the 2009 Virtual Advent Tour, and the day that we launched the Alphabet in Historical Fiction over at Historical Tapestry. Over the last 3 years Kailana from The Written World and I have been cohosting the Advent Blog tours where we ask people to share their Christmas memories, recipes, traditions etc with us all. This year, we are doing it a little bit differently in that we have set up a separate blog for sign ups, buttons, and the daily posts talking about where the stops will be! We hope that lots of you decide to sign up and join in on the fun this year. If you would like to have a look at some of the posts in previous years, you will be able to find some links here. We also launched our first challenge over at Historical Tapestry - the Alphabet in Historical Fiction. Alex has once again done a stellar job with the button for this. The idea is to write blog posts which corresponds to the letter of the alphabet that we are up to! It could be a book that you are currently reading, or one that you have read a long time ago. The book title, author, main character could be your subject or perhaps a famous person from history, or a location where a famous event took place. We are hopeful that this might be something that other members of the historical fiction blogging community might like to participate in! Click on the link above for full details! 21, 22, or 23..that would work really well for me. Looking forward to all the great blogs. Three blogging events and once and you didn't jump through a window? I'm impressed, I don't think I could do it.